In Manhattan Project, you are building bombs. To do this you need to collect resources (Money, Yellow Cake, Plutonium and Uranium), hire workers (scientists, engineers and laborers), build your air force (fighters and bombers). Essentially Manhattan Project is a worker placement, race game. The first player to reach the scoring goal (different depending on the number of players) is the winner. Each round you will do 1 of 2 things. Either place workers or retrieve workers. Placing workers mean that, you will choose one action on the main board to place a worker and then place any number of workers on your own buildings. If the action you chose on the main board was Espionage then you can place workers on another player’s buildings. Also, when choosing this option you can do any number of bomb actions. Building, loading or testing are the 3 bomb actions. Building is how you score the points for the bomb, loading increases a bomb’s point value by 5 (lowering your bombers by 1) and testing is a little more complicated but essentially after you test any one Uranium bombs, your future Uranium bombs are worth more. Retrieving worker simply mean that will take your workers off of the main board, your buildings, your completed bombs and any opponent’s building, and you will also retrieve all Contract Workers from the main board and your buildings. The Artwork in the game is good and really helps bring the theme across. The components are top notch (however there back of one of the starting building cards was printed incorrectly but this does not affect game play in anyway). The worker tokens in this game are extremely cool! This game is a lot of fun. You are collecting resourcing, building buildings, and developing bombs, but you can also, use your fighters to attack other player’s fighters and then use your bombers to bomb their building (making them unusable until repaired). Lots of good decisions to be made, but keep an eye on the other players score because whoever hits the goal first, is the winner! This is one of my favorite worker placement games, The theme is awesome and the game play has some Euro elements (resource and money management) and some Ameri elements (Bombing other players, using espionage). 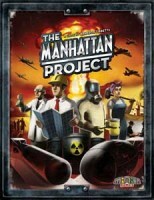 The Manhattan Project is a worker placement game for two to five players, aged thirteen and up. Each takes control of a country’s atom bomb project and attempts to build the most effective program. Starting with a few workers and a little money, they train engineers and scientists; construct buildings—universities, factories, mines, and reactors; build up their air forces—bombers and fighters; research bomb designs; and conduct espionage against each other, all in a race to see who can build the biggest bombs (and score the most Victory Points). The game is built around a simple mechanic—worker placement. Each turn a player must either place his workers on the board or retrieve them. When placing them, a player must place one worker on the main board, but can place as many workers as he likes on his own buildings. When retrieving them, he must remove all of those previously placed. The game revolves around the Main Board. This has spaces for the Building Cards—six initial cards followed by the regular buildings; spaces to place workers to gain money, engineers, scientists, workers, fighters, bombers, and yellow cake—which is turned into Uranium and Plutonium; conduct airstrikes and repair buildings; and fuel tracks to monitor each player’s Uranium and Plutonium, and how many spies he can assign to other players’ empty buildings. Each player has a Player Board. Here he tracks the number of fighters and bombers he has and places any buildings purchased. A player also has four labourers, but gains up to four engineers and four scientists as play progresses. If these are not enough, he can hire contractors, but they will do only one task each. Initially, each player has limited options. He can only place a single worker on the Main Board—and needs not only scientists and engineers, but also his own buildings if he wants to place more workers on subsequent turns. As play progresses, he will gain more workers and buildings, giving him more options for placing his workers—even more if he has invested in espionage and can send his workers to use other players’ buildings. A player is not obliged to place all of his workers on a turn, but he must place one on the Main Board at the very least. When a player runs out of workers or because he wants to, he can retrieve all of his workers. He can start placing them again on later turns, but part of playing The Manhattan Project is knowing when to retrieve and when to place them. It is a matter of timing, more so when espionage is an option and other players’ buildings are available. Each building gives its benefit as soon as its requirements are fulfilled. This might be as simple as one or two workers or specific worker types to get their output, which can be more workers (including contractors), money, fighters, bombers, or yellow cake. Alternatively, reactors require several engineers and scientists and several pieces of yellow cake in order to produce either Uranium or Plutonium. These have to be placed in one turn rather than added bit by bit. Eventually a player will want to build a bomb. This works just like any other building, but requires Uranium or Plutonium plus engineers and scientists. Once built, a bomb adds to a player’s Victory Point total, but it can be loaded onto a bomber for more Victory Points. Or it can be imploded. This destroys the bomb, but any subsequent Plutonium device the player builds will be worth more Victory Points. Apart from espionage, a player can interact with his rivals by attacking them using his air force. He does this by sending his fighters to attack his target’s fighters and then his bombers to target and damage his rival’s buildings. This stops his rival from using them until they are repaired. Physically, The Manhattan Project is nicely and engagingly presented in a style that apes the look of government style art of the 1940s. The rulebook is also well written and easy to read and understand. Unfortunately, The Manhattan Project is not perfect. Arguably, the use of espionage is too powerful—though it is a great way to win—and cannot be blocked or stopped, except by the targeted player placing and keeping his own workers on this buildings for as long as possible. The Air Raid mechanic is either too powerful or not powerful enough, as any attempt to destroy another player’s fighters leaves both sides vulnerable to bombing raids. Lastly, the appearance of the building cards is too random; beyond the first six, any card can appear in any order and this can affect the flow of the game. Less effective buildings will sit on the board because no one wants to buy them, whilst a slew of good buildings will force a flurry of activity to buy as quickly as possible. Perhaps a more structured draw could have been included, so that the buildings get progressively better and better as the game progresses? Put these issues aside, for The Manhattan Project is an excellent game. The game play is very tight, with almost no luck involved and the play time is shorter with practice. It is a pleasing meld of theme with mechanics that reward efficiency. I almost bought this game sight unseen just in appreciation of the relatively modern theme. We’re building a castle? Ok, that sounds pretty good I guess. We’re building NUCLEAR BOMBS? YES. I am IN. If you’ve played Caylus or Stone Age you’ll immediately catch on to the mechanics in this game. On your turn, you place one worker on the main board, then as many as you want on your player board. You collect resources, build buildings, and take other actions to get ahead of your competitors in the arms race. Where this game diverges from the other worker-placement games I mentioned is it’s interactivity with other players. You can use your opponents’ buildings (preventing them from doing so), and can even attack them directly, damaging buildings and making them inoperable until repaired. To clarify something in the “First Impressions from a Newbie” review. He mentions someone winning the game in one round. In case it’s not obvious, he means that in one round the winning player went from 0 victory points, to having enough to trigger the end of the game. The game certainly didn’t take one turn (the game doesn’t really have rounds) to play out in general. That player took several turns to get himself in position to end the game, and the other players likely missed opportunities to slow him down. This is a great game. I think Caylus is bit better overall (the turn order and round mechanic Caylus uses adds a lot of strategy), but the theme and the interactivity make up the difference for me. The Manhattan Project will be a staple with my group for a long time. The game plays in around 90 minutes, and I think is probably a more-the-merrier type game. It’s fine with two, but obviously the competition for spots on the board isn’t as interesting with less competitors. Each additional player adds more difficulty and more divergent tactics to the game, which increases the enjoyment factor immensely. Highly recommended, especially if you’re a fan of Stone Age or Caylus and want a change of scenery. I just recently got the opportunity to play this game. I had seen it on Kickstarter but did not end up pledging. I had never played a worker placement game before, so this was all new to me. Given that I had never played a worker-placement game, I was pleasantly surprised with how quickly I was able to pick up the game. I was playing inside of five minutes. The competition for constructions, espionage, production of workers, and ultimately the race to build a bomb was extremely engaging. However, according to the player running the game, the victory conditions are 45 victory points. Being as how a plutonium bomb with a bomb test and loaded into a bomber can be more than enough to satisfy these conditions. The same can happen with two low-cost uranium bombs played in the same round (which is how our game ended). Because the game can end in one round, it is tough to make much of a competition of it. Our five-player game ended up being 45pts, 8pts, 0pts, 0pts, and 0pts. Because of the all-or-nothing nature of the game, I give it a replay value of 3/5. What initially drew me to the game was the combination of a serious topic (proliferation of nuclear arms) with components that lighten it up including cutesie-looking meeples. The artwork was impressive while not being too detailed as to detract from the gameplay. I give the components a solid 4/5. As I mentioned above, we were sat at the table no more than five minutes before play began. It was fairly intuitive and I understood the goals of the game and how one might go about reaching them. However, the newer players did not have much strategy and ended up falling behind. I believe this means the game is easy to learn but difficult to master, so I ended up giving the learning curve a 3/5. All in all, it is not a bad game. I would play the game again, but I would probably not buy it. Although you might think that in a game about nuclear bombs there would be a fair amount of nuking, that is not true in the Manhattan Project. However, the game is far from boring. It is a great example of a worker placement game with more depth to its’ strategy than Lords of Waterdeep. There is more than one path to victory, but not so many that the game becomes inaccessible. It plays well with the full range of players, even just 2. The components are all quality, though I wish there were a few plastic minis (maybe the airplanes) instead of cardboard tokens. Although combat is not the main function of the game, it is possible to attack other players during the game, though it is not necessarily advantageous. The need to quickly amass victory points keeps players who are prone to combat from being able to afford to ruin others games. Add a Review for "The Manhattan Project"